Urs and Marianne Schildknecht immigrated to Canada in 1979 as a young couple from Switzerland. Urs has the flying bug, and after obtaining his commercial pilot’s licence in Switzerland his first job took him to Libya to fly a Pilatus Turbo Porter in the oilfields of North Africa. This taught him a great deal about operating airplanes in harsh climates and allowed the Schildknechts to save money to start their own air charter business on April Fool’s Day 1981 in Fort Liard, NWT. Marianne and Urs lived for 5 years in this remote community while the Liard Highway was being built. The experience of witnessing the transformation of a community which was only accessible by air to road access was remarkable. Urs and Marianne made many good friends in the local community. After successfully operating the Air Charter business in the NWT, getting to know many of the great fly-in fishing lakes in the area, Marianne and Urs decided to develop a fly-in fishing business. In the heart of the Northern Rocky Mountains they found the Highland Glen Lodge on Muncho Lake (Mile 462 Alaska Highway). 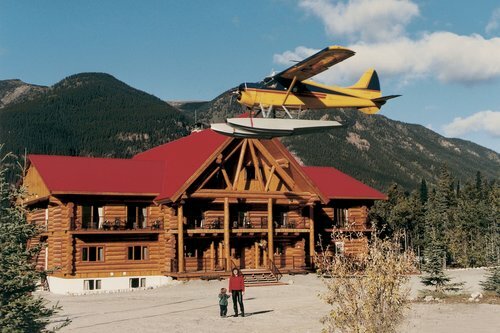 This unique property would make an ideal base for their floatplanes to continue flying into Nahanni and to access the fish and game rich Northern Rocky Mountains. Marianne and Urs purchased the Highland Glen Lodge in late 1988, they soon realized that the existing buildings no longer met the expectations of many Alaska Highway travelers and growing number of fly-in fishing guests. The paving of the Alaska Highway was completed in 1992. Vast improvements to the highway conditions changed travel patterns. Taking advantage of this unique opportunity, the family decided to build the new 14,000 square foot Northern Rockies Lodge in 1995 which to this day is the largest year round hotel and RV operation outside of any town on the Alaska Highway. Urs’ passion for flying in this beautiful and remote country is as strong as ever. 2019 markes Urs’ 44th year of being a pilot. 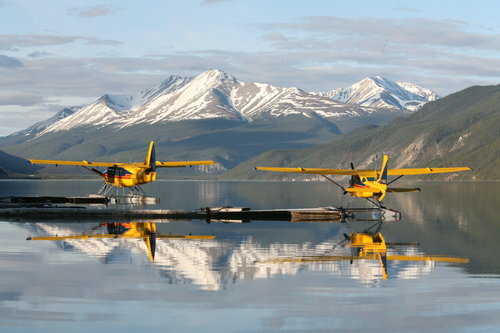 He loves showing his guests the beauty of Nahanni National Park and the Northern Rocky Mountains from the comforts of his floatplanes. Marianne and Urs have two sons, Daniel and Michael. Daniel completed a 3 year chef apprenticeship in Adelboden, Switzerland. As parents, Marianne and Urs are proud to see Daniel taking over the reins of the Northern Rockies Lodge kitchen. Michael is an electrician in Fort St. John, who often comes up over the weekends to help in the family business. Marianne and Urs thrive on taking on the challenges of operating in the North and turning them into opportunities. They would like to thank their countless guests over the last 38 years for helping make Northern Rockies Lodge one of the most successful businesses on the Alaska Highway. Urs, Marianne, Daniel and Michael look forward to sharing their paradise on Muncho Lake with their friends and guests for many more years to come! Over the last 3+ decades Marianne and Urs' exclusive fly-in fishing business has attracted guests from all over the world. Many of whom have annually returned ever since their first trip. The Northern Rocky Mountains are truly the last untouched fishing destination in North America. There are over 70 lakes and streams for guests to choose from! Each offering a unique fly or spin casting fishing experience in the natural splendor of the Northern Rocky Mountains. Urs' modern fleet of turbo prop powered floatplanes offers the only access to this vast and virtually unexplored fishing territory. Encompassing numerous provincial parks and protected areas including the Muskwa-Kechika.